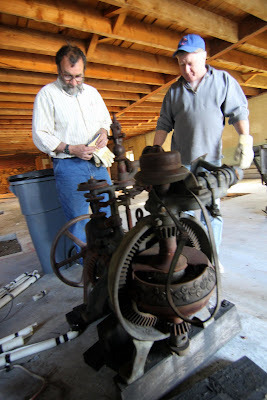 Paul Dionne, left, and David Milz, check out a contraption donated as scrap by Chase Mills condos. DERRY – What's rusty, looks like a cross between a pot-bellied stove and a torture device, and was once used at Benjamin Chase mills to turn local wood into profit? Dave McPherson doesn't know, either. 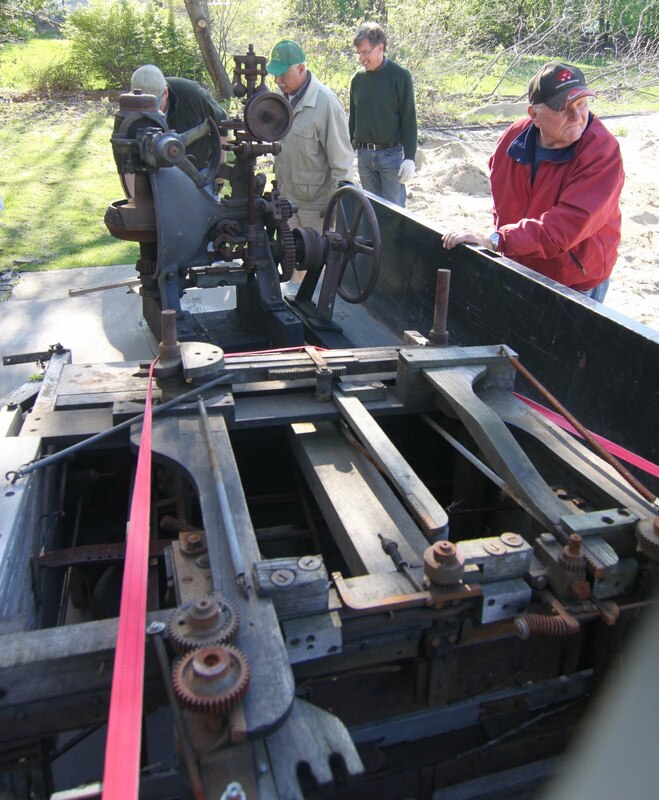 But when he got a call to come pick up some scrap metal languishing behind the old mill on Chester Road, he recognized a solid piece of town historical treasure when he saw it. In his quest for scrap metal on behalf East Derry Village Improvement Society, to benefit the restoration of the old Town Hall, McPherson has been getting calls from residents and businesses with unsightly hunks of metal, which he is happy too retrieve. When he got a call from a member of the board of the Benjamin Chase Mill condo complex – the old Benjamin Chase Mill which was converted to condominiums about a decade ago – he was happy to oblige. But as soon as he saw the old boiler, which had been pulled from the plant during renovations and left for dead in the woods, he knew he'd struck historic gold. Webb Palmer, in red, recalls bygone days. That's when he got a closer look at two other machines – one is almost certainly an old saw, which was pictured in “Derry Revisited,” a chronicle of the town penned by town historian Rick Holmes. The other, probably a custom-made machine used to manufacture dowels or tongue depressors, said Webb Palmer, who remembers trolling around inside the mill as a kid. 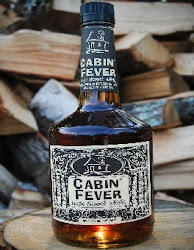 “I worked for Hayford Kimball Lumber Company back then. My job was to go to Chase Mill with the rough lumber. I can still see the guys greasing up the machinery, all of it made for that specific mill. I remember being fascinated at the thought of how ingenious someone was to figure out a machine that could manufacture a tongue depressor,” said Palmer, who serves as President of EDVIS. On Friday McPherson and several others got together to move the two heavy machines from the woods to the old Town Hall for safe keeping. They will soon be donated to the town's history museum, said Rebecca Rutter, acting chairman of the town's Heritage Commission.